School of the Incarnation offers a comprehensive arts and music program that gives students the opportunity to develop their talents, self-expression and creativity. Whether it's in the classroom or in after-school activities, students are encouraged to explore their artistic interests through visual arts, music and drama. Students explore the visual arts through weekly art classes. All students in Kindergarten-Grade 8 participate in weekly art classes which provide instruction in various media and techniques. Students can further pursue their artistic interests in our after-school Art Club. Each spring, the school hosts an Arts Alive event in which every student in the school has a piece of art on display and small groups of students will perform in choral, instrumental band or dramatic groups. Weekly music class gives students an exposure to a variety of instruments, music theory, vocal music, introductory composition, and music history. Elementary students participate in the annual Christmas Pageant while Intermediate students perform in an annual vocal concert. 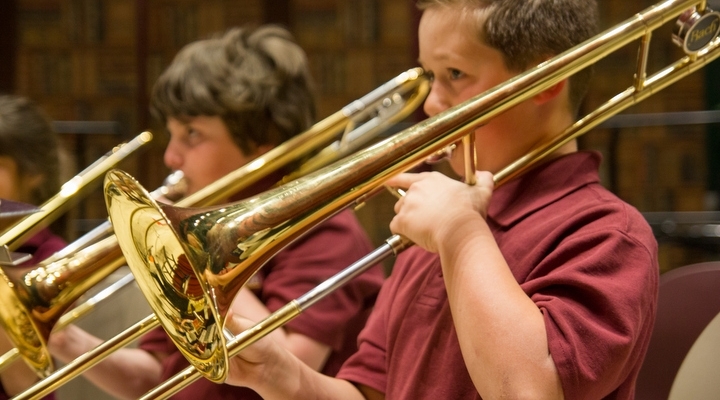 Many other avenues are available for students to further develop their talents: Cherub Choir, Chorus, Liturgy Choir, and an award-winning Instrumental Band. Our award-winning band program provides students in Grades 4-8 with the opportunity to receive weekly instrument lessons and perform with one of three school bands. The bands perform at concerts, school events and competitions throughout the year. Twice a year, middle school students stage full-length musical theater productions. Students are involved in all aspects of production including performance, costumes, make-up, lighting and sound. This after-school activity allows students to develop their dramatic and vocal talents while also helping them to grow in confidence and build their leadership and communication skills.